RICHMOND, BC (PGA of British Columbia) -- Back by popular demand, the PGA of British Columbia, in partnership with the Vancouver Canucks, is proud to once again host Canucks Junior Golf Week presented by Odlum Brown Limited. Canucks Junior Golf Week will take place July 2-9, 2018, featuring dozens of single-day camps for youth located at golf facilities throughout British Columbia. The program is open to all children aged 5 to 18 years old, who can have fun learning the fundamentals of golf from PGA of BC Professionals in their respective communities. Boys and girls of all skill levels and athletic backgrounds are encouraged to register -- no previous golf experience is necessary to participate! More than 2,500 kids have taken part in Canucks Junior Golf Week since 2014, and the vast majority were introduced to the sport for the first time. 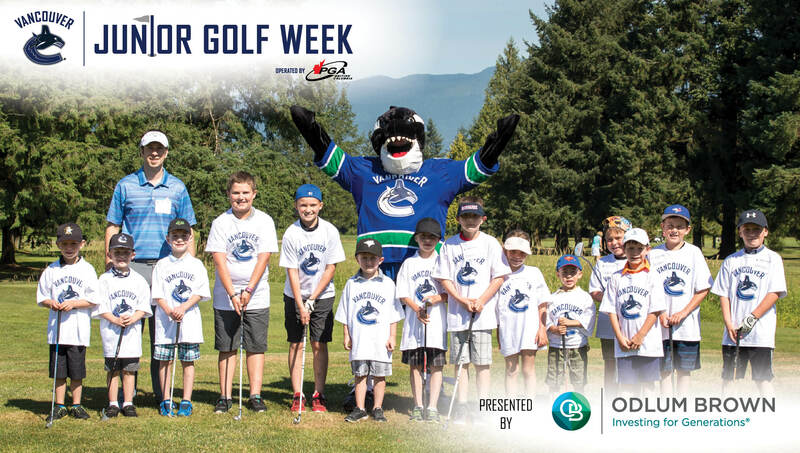 The cost for a one-day camp during Canucks Junior Golf Week is only $20 (+GST), which includes equipment rental (if required), facility fees, certified golf instruction and multiple gifts, including items featuring the Vancouver Canucks logo. The length of each camp will vary by facility, the number of attendees and the general age of the participants, but camps would be estimated to last between one and two hours. In addition to exclusive presenting sponsor Odlum Brown Limited, the PGA of British Columbia would like to thank our contributing partners at Srixon for their active support of this junior golf initiative. The Association would also like to acknowledge BC Hockey for championing the program. CLICK HERE to register now for a Canucks Junior Golf Week camp in your community, or click here to view a list of participating facilities and scheduled camps. Learn more about the program and see highlights from past editions of Canucks Junior Golf Week by clicking here. Please note that registration for all camps will close Thursday, June 21 at 4 p.m. PT. Registration takes place on a first-come, first-served basis and many camps will quickly reach capacity, so early registration is encouraged to secure your preferred time and location.